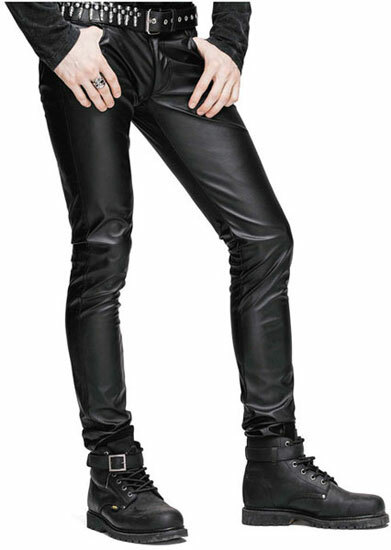 Men's faux leather (PU) pants with zipper fly, front pockets and back pockets. The Decode leather pants are slim fit and have some stretch to them. I wear a 30\" waist. What size would that be with these pants? Thank you! Answered by Dave on Monday 13 March, 2017. Answered by Blue on Tuesday 11 April, 2017. The inseam on these pants are 32 inches. The length on the sizing chart is from the waist down to the end of the leg. Answered by Rebecca on Tuesday 30 May, 2017. As stated in other reviews, these pants run really really small. I'm a 36 waist and the XXLs fit tight as a glove. But they do look and feel great. And Rivithead is easy to deal with and delivers quickly. These do indeed fit a little fit so order at least a size up from wgat you normally wear. But that aside, they look fantastic, especially with the demonia boots I also ordered. For sizing, I have a 34" inch waist but I fit better into the X-Large size instead of the Large size. This is because these pants are slim fit and skin tight through the thigh and calf. You need fairly skinny legs to wear these or buy the larger sizes.